Try these instead of chips! Z Crackers are thin and crisp crackers that are made in six different flavors. The Garlic & Basil are my favorite. Warning! Z Crackers are addictive. The only store that I have been able to find them in my area is Bonterra Market in Northfield. The crackers are also pricy and cost nearly $5 for an 8 oz. package. Since they are expensive, my family knows that they must give to the Z Cracker fund to eat them. If they unwilling to contribute to the fund, then they are off-limits. You can also spice them up with a spoonful of Top Crop Salsa Mango! OOOMMGG! This sauce is delicious and has a zesty kick! Made with fresh mangos, red onions, red peppers, and cilantro! The taste is surprisingly delightful. If you plan to be around people after eating the salsa, chew gum or eat a mint afterwards. The flavor and smell are strong. I want you to see what the top label of the salsa. You can clearly see the mango, red onions, and red peppers. Delicious! I buy the Salsa Mango at Starns Shoprite. You can find it in the fresh produce section near the bagged salads. Since the salsa is fresh, you should eat it within a week of buying. The mango will go bad. Below are pictures of the nutritional labels for the Z Crackers and for a bag of chips. The serving size for each is about one ounce. 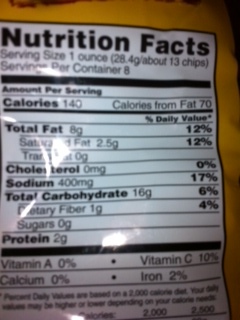 The sodium count in the chips are more than two times the amount in the Z crackers. What’s the big deal about sodium? Sodium is known to increase blood pressure levels. I make it a habit of reading labels, more so for sodium and sugar levels. Since I started my eat clean journey, I eat less processed foods and more fresh foods, so labels aren’t as much as a concern anymore. I do however, read labels for any packaged snacks. Serving size is 1 oz. To avoid over indulging, I take my portion out and put the container away. If I leave the package out, I will eat more than I should and that’s not good. I also eat my snacks later in the evening and after dinner when the house is settled and folks are in bed. Which means, no interruptions from family and I can savory every single bite. Lol! Maintaining a healthy lifestyle is habit-forming. Like anything else that we do, our actions form habits. Some good. Some bad. It’s up to us to find a balance between the two. For me it means making smarter choices about nutrition and exercise. The most motivated person still has weak moments and gives in to intense cravings for sugary sweets, salty treats, or tasty liquids that contain more sugar, calories, and fat than normally consumed. 1. Find a healthy substitute that is equally appealing. 3. Indulge in the treat anyway, but LESS often and in SMALLER portions. Anyway, you can find more information about Z Crackers by clicking on this link. I hope that you give the Z Crackers a try. If you do try them, tell me what you think about them. This entry was posted in Family Living, Fitness, Healthy Eating and tagged chips, Cracker, crackers, Eating, healhy snacks, Potato chip, potato chips, Snack, z crackers. Bookmark the permalink. I am so glad you posted this because I was doing so well until a few days ago. I had a soda because my stomach was upset from eating a doughnut. I know this is all so very pathetic : ( But I was at the Amish market, which is much too close to my home. Oh, and then didn’t someone have the nerve to open a bakery called The Cake Boutique!!! Ugh! The building itself looks like you can eat it! I need to detox just thinking about it. I just finished drinking a bottle of water. Think I’ll have another bottle. Please keep blogging!!! Sugar addicts need all the encouragement they can get. Much love!!!!! Wait!! The Amish market has new bakery? Or is the bakery by your house? I shouldn’t tell you this but you might already know… the bakery at the Amish market sells freshly baked peach bread that is deadly! Lol! Now that you’ve eaten your sweets for the week, it’s back to the basics. I can’t wait for you to try the Z crackers… they are so good. I want to hear what you think of them. If you like mangos, the starns in your area may have the salsa. It goes perfect with the crackers. Thanks Shawn!